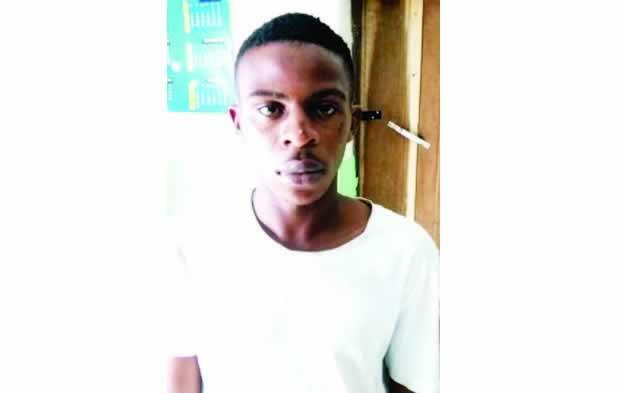 A young man named, Chinasa Oguamanam of 21years was paraded by the Imo State Police Command, For his alleged involvement in armed robbery, murder and cultism. The Command’s Public Relations Officer, Andrew Enwerem, disclosed that the suspect was apprehended by the operatives of the Federal Special Anti-Robbery Squad in the state on August 23. According to Enwerem, the suspect was a member of Vikings confraternity, which had been terrorising a part of the state capital. The state police spokesperson said the 21-year-old was part of a gang that killed one Onyekachi on School Road in Owerri, the state capital, during a secret cults’ clash. “On August 23, the operatives of the Federal Special Anti-Robbery Squad, while on surveillance patrol within the Owerri metropolis and acting on a tip-off, stormed a black spot at Oguamanam Street, Owerri. “In the operation, the officers arrested one Chinasa Oguamanam, 21, a native of Umuonyeche village in the Owerri Municipal Area of Imo State. “The suspect has confessed to belonging to a secret cult known as Vikings, aka Baggas. He also confessed to the offence of armed robbery. “According to his confessional statement, in 2012, himself and his group killed one Onyekachi on School Road among other crimes during secret cult clashes in Owerri. “On August 18, 2018, at gunpoint, the gang also attacked and robbed one Amadi Chinonso of the sum of N25,000, Zenith Bank ATM card, one Lenovo iPad valued at N70,000, National Identity Card and other valuables at Edede Street, Owerri. The suspect, who told Southern City News that he was a member of Vikings confraternity, said he was not the one that shot the gun during operations. The secondary school leaver said he had been peddling drugs since childhood.